Tea today is on my wooden slab that is used for a tray. I have my snowball candle lit and my snowflake dishes. I'm using my Goebel sledding kids for some wintry décor. How about sharing a date bar and some Constant Comment tea with me? This is one of those desserts that takes me back to my childhood. I love these bars and remember my Mom buying a date bar mix for me to make, because I always made desserts for our dinners. This mix can't be found any more, and I think it was made by Betty Crocker. Here's a wonderful recipe for them, if you're a date lover like me. This recipe makes an 8" square pan and can easily be doubled for a 9" x 13" pan. Mix 8 ounces of cut up dates, 2 T. sugar and 3/4 cup of water in a saucepan. Cook, stirring occasionally for 8-10 minutes, until thick. Using a potato masher really helps break the mixture down. Let cool. Cream together the butter and brown sugar. Mix in remaining ingredients until crumbly. If needed, add about 1-2 t. water. Press half the mixture into a greased 8" square pan. Spread with the filling. Top with the remaining crumb mixture and press lightly. Bake at 350 degrees for 25-30 minutes. Mix together 1/2 cup powdered sugar and 1/8 t. cinnamon. Add enough milk to drizzle. Drizzle over top of bars. I love dates and would love these date bars. We make date balls for Christmas and they are also yummy. These bring back memories for me too Kitty. I still have my late mother's stained recipe card for date squares. It would be nice to have one with a cup of tea. Ohhh these bars look delicious! And what's better than some cozy tea time! Oh, those date bars bring back memories for me. When I started high school there was a bakery just a building away, and I often ran over there for their date-nut bars to have with my lunch. Thank you for sharing your recipe! I've never had Constant Comment tea. I'll have to give it a try. Have a great day! I don't know what I like more: The fact that there is a tea called "Constant Comment" (which should therefore by dubbed the official tea of Debbie Land) or the recipe for the date bars. I'm a huge date lover. I will be trying yours. (BTW, if your blog ears were ringing over the weekend, it's because Denise at "Forest Manor" and I were e-yakking and somehow came to the topic of how much we love the recipes on the this blog and the blogger behind them. Thank you thank you thank you! My mother used to make date bars and I loved them. This certainly takes me way way way back. Constant Comment -- yes! I'll be right over! LOL! Happy Tea Day! I make Constant Comment Iced tea for my husband every week. It is generally what he has with his lunch. I occasionally make hot tea with it for myself but he seems to prefer the iced version and it is easy to make! I love the smell of it.... and if you add a few finely chopped walnuts to the hot tea it makes a wonderful little extra treat. Your date bars look really great, Kitty! I'll have to give them a try! I like your tea setting too. What cute little figures and candle. Thanks for sharing your recipe. Yum; I love date squares, Kitty, and your recipe is very similar to my own. I never thought of using the masher. What a great tip! Your snowflake dishes are really pretty. Thank you for sharing and coming to tea. Yup, I'm skipping around the kitchen table. I love these things and have never made them. I've pinned them so I hope that I will remedy that! This look just wonderful and they made me think of how Mom used to make her own date filling for sugar cookies. Oh, I just loved them-I am going to pin this recipe! I REALLY REALLY looove date bars. Yours look so wonderful. Love the plate/mug...the fireplace...the figurines...the candle. Everything is inviting. Wish I could come and visit with you right there. Thanks much for sharing at Weekend Potluck! 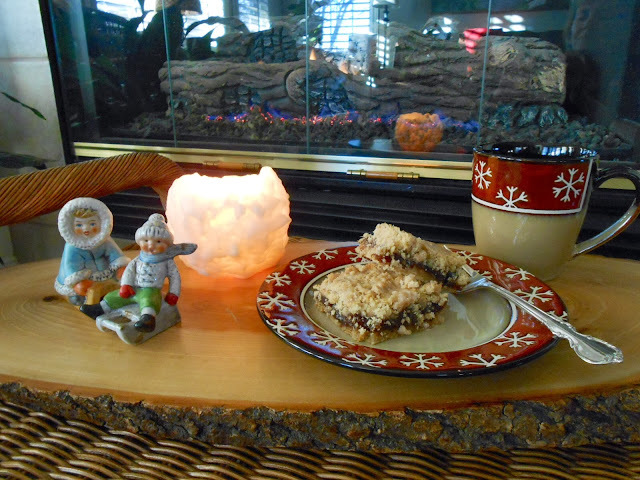 What a perfect dessert for a cold winter day. You set up a darling little vignette here! Yummy! What an enticing vignette...makes me want to just sit right down with a hot cuppa tea (LOVE C.Comment!) & chat with you over those delicious looking date bars. When I saw the photo of them, it reminded me of another recipe that I have not made in AGES...totally different taste but very similar in appearance. I'll have to dig it out & make it again soon. Oh my! These look so good. I'm not eating things like this on a regular basis, but I am SO PINNING THIS! The funniest thing - I just found a container of dates in my pantry and thought, "I really need to find a recipe and use these." So glad to see you at SYC. Have a great week. Love date bars and constant comment tea. I am so glad to get a good recipe. I am thrilled to have this recipe. Growing up my mom use to buy a date bar mix in a box. Us kids all loved them! Have not seen it to buy in years. These look just like them. Will be making these for sure! Thanks for sharing with SYC. 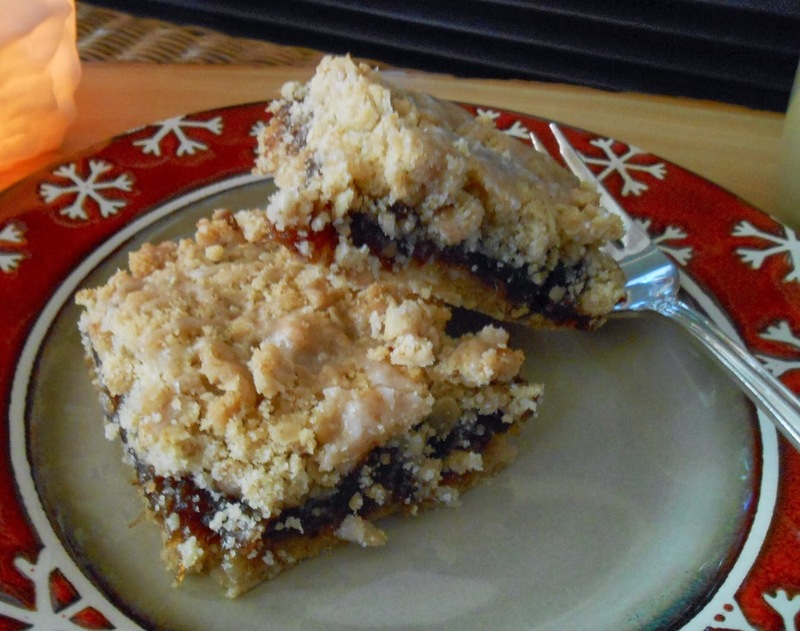 Your Date Bars look delicious, I just love using dates in different recipes. Looks like a very cozy setting for a nice dessert. Thanks for helping us celebrate Three Years at Full Plate Thursday and come back soon!